Caring for someone with Alzheimer’s is a challenge. There are no two ways around that statement. No matter how your loved one is at the start, the slow progression of the disease will eventually lead to a challenging lifestyle of care and comfort. Most of the time, children of those affected by the disease want to take as many steps as possible to help their parents go on with their lives, even as the disease continues to progress. This means jumping into everyday tasks for your loved one as a means of easing their daily stress levels. From bathing to feeding, and everything in between, your care can help fight the onset of the disease. That is, if you are doing what is needed. Thus, therein lies the predicament that most people caring for a loved one with Alzheimer’s run into; Am I doing this right? 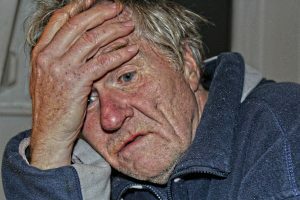 Many people are scared that taking the care into their own hands might result in their loved ones not being around as long as could have been, or that their care is simply not working for their loved one. Even if this isn’t your first rodeo with a loved one suffering from Alzheimer’s, no one wants to watch a loved one slip down the rabbit hole of the disease and be left asking, “could I have done more?” To combat these feelings, we are putting together the ultimate guide for caring for someone with Alzheimer’s, so you can understand how the little things you do help with the big picture. For those of you not caring for your loved one on your own, this list is a great way to keep tabs on your hired care. This way, should they not approach a situation as you would, you can work with them to adapt their processes to your loved one. We are going to go through the common mistakes many people make while caring for a loved one with the disease. Then we are going to move on to what you can do to avoid those situations, and tell you what you should do. The first things that many people do wrong is simply not looking for tips for caring for someone with Alzheimer’s. They simply go about their care for a loved one as if they were totally fine. They often ignore the fact they are suffering from a disease. 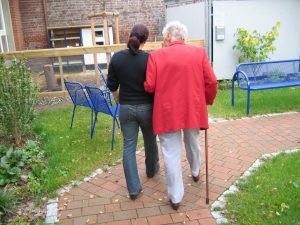 This typically leads to a harder time caring for their loved one in the long run because they tend to fall into holes that are common with Alzheimer’s care. To avoid these pitfalls, let’s look at a few of the things you shouldn’t do while caring a loved one with Alzheimer’s. The first major thing you shouldn’t do to a person with Alzheimer’s is argue with them. This can sometimes be a challenge because they may say things or do things they wouldn’t have said or done prior to the disease. This can lead to an easy argument, but you should do everything in your power to avoid this. If they just ate lunch, but they talk about needing food, say something like, “we should get you a snack,” instead of arguing about the lunch they just ate. Their view is limited from the disease, so forgetfulness can run rampant. Don’t argue, just help when you can. The next thing not to do is put your loved one in a box. Alzheimer’s is individualized for each person. This means that they may or may not show generalized signs of the disease. This also means that each case has to be treated with a unique approach. Grandma might be forgetful because of Alzheimer’s while Grandpa seems to be losing motor skills instead of memory. When helping your loved one, make sure you know the signs of Alzheimer’s, so you can prepare and adapt your care as needed. Along with the adaptive care, you need to make sure you stay away from shaming. At the end of the day, these people are your elders who are suffering from a disease, so be kind. If you start to shame them for outbursts they can’t control, they are more likely to feel shame and confusion. Instead of reprimanding them for uncontrollable outbursts, take some time to ask questions and get to the root of the problem. If your loved one has an outburst in public regarding certain people or things, take them to a more private area and talk through the issues at hand. Remember, take it slow, and don’t talk down to them. Choose your words wisely. This next step is a challenge, but it’s probably one of the most important parts of caring for a loved one with Alzheimer’s, or any form of dementia. Don’t do everything for them. There may come a time in their care when doing everything for them is necessary, but at the start, don’t do that. Instead, let them do what they can, and help them along the way if needed. Let your loved one struggle a bit with common tasks, as it helps them keep their mind sharp. If you start to take over for everything, it could be a huge blow to their dignity, and that could make conditions worse. One of the biggest no-nos is simply not believing them when they get paranoid. If they talk about abuse or theft, make sure you look into their claims. They might be having an episode, or they might be getting abused as they say. The final thing you shouldn’t do is resort to medication for tough times. Some episodes will need the help of medication to call the symptoms at hand, but they shouldn’t be a crutch. Jumping into medication at the first sign of an issue is just as bad as refusing to let them take medication at all. All-in-all there are plenty of things you shouldn’t do, but let’s move on to what you should. Daily care is the most important part of taking care of a loved one with Alzheimer’s because it’s where personal interaction takes place for your loved ones. If you are caring for your loved one in your home, this section is extremely important to understand. 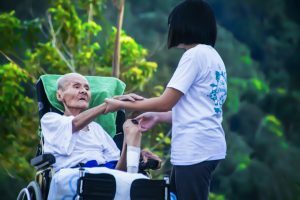 If you are having your loved one cared for at a facility or in their own home, make sure these are all taken care of by whoever is providing the care. Bathing can be a sensitive subject, especially for people with Alzheimer’s. If your loved one is really big on keeping their independence while bathing, get them items that enable that to happen. Things like rubber floor mats and shower chairs are huge helps for those who have issues with falling in the shower. You can also look into installing sturdy shower handles, or look into a shower with a seat built in. They even make shower heads with handles that can be used to make showering easier. This is especially true if you have to help your loved one. If you loved one is in need of help showering, just make sure you accommodate them as they need. You should still let them take care of as much as they can on their own. They are losing abilities, not being taught, and letting them handle what they can is a great way to help them care for their mental health. Sometimes special care facilities will have a team of people who help your loved one bathe. If this is the case, ask your loved one about their experiences to make sure they are taken care of. If your loved one suffering from Alzheimer’s starts to complain about abuse or theft, investigate their claims. You always want to ensure your loved ones’ safety in these situations. These conversations can help you determine how your loved one’s disease is affecting their daily life. Getting dressed is yet another challenge in the daily life of someone suffering from Alzheimer’s. They may find it difficult to put their own outfit together. If this is the case, try laying out their outfits for them. Some patients will only want to wear a specific outfit that comforts them. If you find yourself in a situation where a loved one will only wear one outfit, try purchasing multiple copies of that outfit. This way you don’t have to wash an entire outfit each night. Doing so will help your loved one stay in clean clothes, and stay in their outfit comfort zone. Another this to keep in mind is the types of clothes your loved one wears. Try to get them into an outfit that is easy to put on and comfortable. Things like buttons, buckles, belts, and other tedious tasks should be avoided as much as possible. The frustration of these tasks are enough to cause another episode in itself, so it’s best to avoid them. Mealtime can be another hectic situation, but there are some special tactics you can use to make meal time simple and easy. First off, turn off the TV or radio. These sounds can be a major distraction for anyone at the table. They could even could cause an episode of confusion. If serving a lot of food starts to overwhelm your loved one, try serving each portion of their meal one at a time. Some people start to have issues with vision towards the later stages of Alzheimer’s, too. If this is the case, try putting foods on high contrasting plates and placemats. The visual contrast will help your loved one stay focused on the food. If you loved one starts to have issues with chewing or silverware, you can always start to change up meal time. Meals like tuna sandwiches and applesauce are amazing foods that can help your loved one get the nutrition they need. Remember, give them all the time they need to finish their meals. Don’t try to rush your loved one because it can be an immediate hit to their dignity. That alone can cause major issues for your personal relationship while you care for someone with Alzheimer’s. It might be harder to patch than you think. Many patients and caregivers report having issues with Alzheimer’s patients and sleep. Sometimes they can be restless souls with no reason for it. If this is the case, you might want to swap how your days are planned out. If you are planning a large activity with your loved one, try to make sure it’s towards the beginning of the day. Having larger activities early and putting your larger meal towards the beginning of the day set your loved one up for a restful night of sleep. To help them even more, try to set some mood lighting towards the later stages of the day. Let the low lights come in as the sun starts to set. Don’t overpower them with your lights in the house. If you have lights you can dim, that will also help them prepare for bedtime. Try to keep their environment calm and peaceful during these times, as chaos can often lead to panic and stress. It’s also a good idea to put night lights in their room, hallways, and bathroom. Just in case they have to wake up and go to the restroom at night. Having that area already lit will help your loved one navigate the hallways to the bathroom, even if they can’t find the light switch. Finally, and this goes for everyone, limit caffeine intake. It will help them, or anyone, sleep better. Traveling is absolutely possible, even while you care for Alzheimer’s patients. The trick to a successful trip is preparation, but that’s a given with any travel. When you are traveling with a loved one with Alzheimer’s, make sure you are picking a destination that person is already familiar with. You know, pick an area that was familiar before the disease took hold. This way, you can remind your loved one that they have been where you are going, and you can ease their worries about the journey. Once you know where you are going, it’s time to pick your mode of transportation. Flying can be a stressful situation if you loved one isn’t prepared, but driving can cause just as big of a problem depending on the length of the car ride. If you choose to fly, you might want to take some time to contact the airport and the airline to let them know ahead of time that you will be traveling with an Alzheimer’s patient. Many airlines have special protocols to help your loved one reach each gate on time, and calling ahead makes it easier for them to prepare. When you are going through the security lines, it may be necessary to inform the TSA agents that your loved one has Alzheimer’s. Ask them to watch your loved one while the rest of the travel group makes their way through security. If you choose to drive, just keep in mind that you might have to make frequent stops along the way. Sometimes, sitting for extended periods of time in the car can be harder on a person than the 3-hour flight. Ultimately, it comes down to the person’s preferences, and you should accommodate accordingly. When you are traveling with a loved one with Alzheimer’s, make sure you have an extra bag filled essentials just for them. A change of clothes, snacks, water, and activities are all great to keep on hand. Make sure you also contact the hotel you are staying at. Just like the airlines, certain hotels will be able to provide you with specific accommodations to help ease the stress of travel for you and your loved one. Finally, make sure you create an itinerary for your trip. Once it’s complete, share it with a few close family friends, so they know what’s going on with your travels. You never know who can help in a time of crisis, so make sure the right people know where you are going. Communication is another extremely important factor in caring for an Alzheimer’s patient. You might find that your loved one’s communication skills might change drastically, so it’s up to you to be prepared. We are going to take a look at a few of the major communication queues for Alzheimer’s patients, and how to help them. Alzheimer’s can result in hallucinations or delusional behavior, but you shouldn’t fault them for it. They can’t control those emotions, so it’s up to you to help. If you loved one starts to have fits or hallucinations, it’s time to step up and communicate with them. Try to get their undivided attention, so you and that person can talk about what is going on with them at that given time. Ask them what they are seeing or what is making them feel uncomfortable. If they have no explanation, get them to move to a new area with you. Mood swings are another big factor for Alzheimer’s patients, and they can happen without warning. One minute, your loved one could be happy and enjoying themselves like normal. The next they seem cold and shut off. Should a situation like this arise on a trip or out in public, don’t panic. Instead, start to talk to them one-on-one to decipher the issue. If you have noticed something particular that caused the mood swing, ask them directly if that’s the issue. Don’t let them get frustrated with trying to find the “right words” to explain, and try to direct them if you can. If there is no real solution to the mood swing, it might be time to move onto the next activity. Keep in mind that these experiences are normal for people with Alzheimer’s, so don’t take their mood swings personally. Even the best situations can turn sour in the blink of an eye, so just realize it’s always a possibility. Socializing with your loved one who is suffering from Alzheimer’s changes as the symptoms progress. So, let’s start with the early stages. In the early stages of Alzheimer’s, you might start to notice a few major social queues with the way your loved one interacts with you. You might see them start to search harder for the right words. They might stumble over easy words. They could even forget what they were saying in the first place. During these stages, it’s completely ok to put a word or two in your loved one’s mouth for the sake of them completing a thought. This is a great way to help them keep their minds sharp and fight against the continued progression of Alzheimer’s. Other signs that your loved one is starting to struggle with communication include excessive hand motions. The repetition of comfort words. Even a lack of interest in communicating in general. Remember, it’s ok to laugh about these blunders, but never use the time to belittle a person. The humor can help them brush off the issue, but belittling them could exacerbate the issue. You want your loved one to feel included, so don’t cut them out of a conversation simply because they forgot. The middle stages of Alzheimer’s push the communication struggles a bit further. Your loved one will probably trail off more during conversations, and they might find it hard to make decisions. This is where choosing your words wisely will make a big difference in their day-to-day life. Start by changing your word usage to a more direct style. Instead of asking, “would you like something to drink?” try directing it to, “would you like a cup of coffee?” This takes the guesswork out of the situation for the person suffering from Alzheimer’s, and leaves them with the opportunity for a simple yes or no. During this stage of Alzheimer’s, it’s important to do what you can to maintain eye contact and simplify your engagement. To do this, try speaking slowly and clearly, and stick to one question at a time. Too many questions or quick speech can lead to confusion. You can also start to incorporate motions into your speech as visual cues to help your loved one understand the meaning beyond the words. This also encourages them to continue participation, even if they are getting a bit lost. In the later stages of Alzheimer’s, you loved one might have issues with remember just about anything. Make sure you approach them from the front and identify yourself. You might start to see your loved one’s condition lead to a loss of motor function. With it, you might see their ability to speak start to go away. If you are having issues with understanding your loved one, ask them to point or gesture, so you can continue to communicate. If your loved one has all but lost the ability to form words and express themselves through language, encourage non-verbal communications. Remember, you don’t always have to talk. Sometimes, being there with them means everything in the world to them. As the disease continues to progress, you need to keep a realistic view on their care. If you need help caring for your loved one, there are tons of different options for Alzheimer’s care to meet your needs. From in-home elderly care groups to full-fledged Alzheimer’s care facilities, there is a program out there that can help you on this journey. If you don’t know where to start, you can reach out to Above and Beyond Senior Care Placement. We offer you free consultation and placement services, so your loved one can get the senior care options they need. There is no bias or push for certain facilities, as we provide you with your options. We want you to know what is available for you, and we want to see your loved one get the care they need. They aren’t a number, they’re a person and a loved one. They deserve all the help they can get through these troubled times. Above and Beyond can help you get it on your terms. Even if you are planning to take these tips for caring for someone with Alzheimer’s into caring for them at home, there is help for that. If you need a full care facility, we can help you find the right one for your loved one’s needs. At the end of the day, no matter what route you choose, just be realistic. If you need more help, we can help you find anything you need for your loved one. Together, we can take care of them, like they took care of you. PrevPreviousDo You Understand Senior Care Options?